Continuing our award-winning streak in 2017, we’ve just bagged the prestigious independent festivals ‘Act of Independence’ award for our showcasing of Muslim art and culture in partnership with Amal and our platforming of Palestinian artists and activists. As you’ll know, this year we were delighted that Amal, a brand new project of the Said Foundation, funded us to create and curate a programme to showcase great Muslim art and culture at the festival. This we did, working with Chicago-based cultural producer Asad Ali Jafri to produce a festival-long dedicated programme of content aimed at celebrating incredible Muslim artistry and culture from across the globe with a view to enabling Greenbelters to experience and engage with Muslim artists to better understand the richness, diversity and vibrancy of Muslim culture. The programme featured Kathak dance from Sonia Sabri, spoken word from Saraiya Bah, comedy from Bilal Zafar, music from Native Sun and Fahad Khalid, storytelling from Yousuf Bashir Qureshi and Avaes Mohammad and and performing arts from Khayaal Theatre. You’ll also know that for decades we’ve spotlighted and supported the human rights struggles of the Palestinian people – and of all those working for peace and justice in the land some still call Holy. This year, we featured more programming than ever before at the festival highlighting the facts on the ground in the Occupied Palestinian Territories to mark the 100-year anniversary of the Balfour Declaration, 70 years since the UN Partition Plan in 1947, 50 years since the six-day war in 1967 and 10 years since the beginning of the blockade on Gaza. And, after being part of the inaugural Palestinian Music Expo in Ramallah at Easter 2017, we were proud to be able to bring across more musicians from the West Bank this year, along with young peace activists – like Israeli refusenik Sahar Vardi and Palestinian refugee and olive harvest activist Muhanad Al Qaisy. Both of these programming drives reflect our progressive, inclusive, open-minded, participatory and generous Christian worldview. It’s wonderful that the wider festival sector has recognised the ground we’re breaking and the bridges we’re building. “We believe these are times in which we need to learn about and from each other more than ever. And a festival is a fantastic setting in which people are more open to this exchange and learning. Greenbelt has invited people from other faiths, and especially Muslim thinkers, for many years. But in 2017, thanks to the support and involvement of Amal, we were able to build a venue and programme dedicated to showcasing global Muslim art and culture – engaging festivalgoers across the weekend with an amazing array of Muslim arts and culture. As well as earning the ‘Act of Independence’ award, we have also been shortlisted for the ‘Mind-blowing Spectacle’ award too – for the art installation Murmuration by artist Nicola Haines at this year’s festival. Already this year, Greenbelt has been awarded A Greener Festival award for our sustainable practice, the Attitude is Everything Gold Standard for our accessibility provision, and a OneBodyOneFaith Rainbow Award for our LGBTi inclusion. National trade organisation The Association of Independent Festivals (AIF) is the UK’s leading festival representational body. Founded in 2008, the AIF operates as an autonomous division of the Association of Independent Music (AIM) with its own board and governance structure. The combined attendance of AIF’s member events exceeds 600,000 contributing over £200m to the UK economy annually. AIF has 65 member events including some of the most successful, exciting and innovative festivals in the UK. Members range from the 1,500-capacity Barn on the Farm to the 60,000 capacity Boomtown Fair and include the likes of Bestival, Shambala, Victorious, End of the Road, Festival No.6, Kendal Calling and many more. Amal, a pilot project of the Said Foundation, makes grants in support of Muslim cultural production in the UK. Its objective is to help increase understanding between Britain’s Muslim and non-Muslim communities and thereby add to the strength and vitality of contemporary British society. Amal believes that culture and the arts broaden horizons and forge common ground within and between communities. It provides opportunities for people in Britain, regardless of their faith or beliefs, to come together and explore the rich diversity of Muslim cultures and arts including storytelling, visual arts, theatre, poetry, film, music and dance. In its current pilot year, Amal is supporting around 40 projects. These range from partnerships with nationally-known arts organisations like the Southbank Centre, Cheltenham Festival and English Touring Theatre to projects with local arts and community-based organisations such as Grassroots Luton, Stratford Circus Arts Centre and CAST Doncaster. 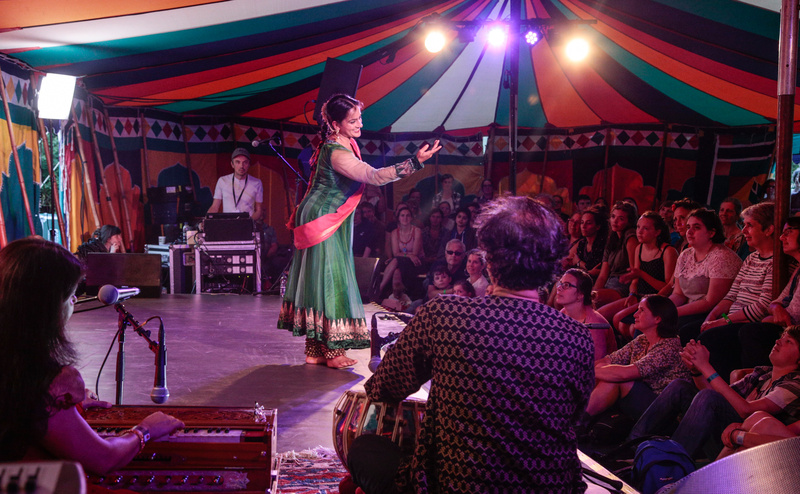 Amal-supported activities go on at festivals, arts centres, theatres, schools, places of worship and in the community. In all its work, Amal is guided by its values of conviviality, compassion and social justice. Greenbelt also enjoys longstanding partnerships with Embrace the Middle East and Amos Trust, both of whom help the festival connect with grassroots projects working for peace in Palestine-Israel. Greenbelt’s Programme Manager Katherine Goodenough went to the inaugural PMX in Ramallah in April. Due to the current political conditions, Palestinian artists are struggling to establish their presence on the international music scene. There is little industry to speak of in Palestine, which makes it challenging for promising Palestinian artists to be heard and promoted around the world. The Palestine Music Expo will celebrate Palestine’s unique and powerful culture that is thriving in spite of the Occupation.